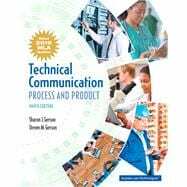 Technical Communication: Process and Product shows students how to produce all forms of written and oral technical communication with easy-to-follow instructions. Interesting scenarios and examples featuring real people on the job make the text relatable to students of all majors. The Ninth Edition builds upon the authors' proven methodology, emphasizes the writing process, and shows students how it applies to both written and oral communication. By showcasing real employees in communication scenarios across a wide range of disciplines – from engineering, to consulting, banking, construction, and biotechnology – the authors showcase the importance of strong communication skills within every field. Sharon J. Gerson and Steven M. Gerso n are dedicated career professionals who have a combined total of over 80 years teaching experience at the college and university level. They have taught technical writing, business writing, professional writing, and technical communication to thousands of students, attended and presented at dozens of conferences, written numerous articles, and published several textbooks, includingTechnical Writing: Process and Product (Ninth Edition), Professional Communication in the Digital Workplace, The Red Bridge Reader (Third Edition, co-authored by Kin Norman), Writing That Works: A Teacher’s Guide to Technical Writing (Second Edition), Workplace Communication: Process and Product, and Workplace Writing: Planning, Packaging, and Perfecting Communication. In addition to their academic work, Sharon and Steve are involved in business and industry through their business, Steve Gerson Consulting. In this business, they have worked for companies such as Sprint, AlliedSignal—Honeywell, General Electric, JCPenney, Avon, the Missouri Department of Transportation, H&R Block, Mid America Regional Council, and Commerce Bank. Their work for these businesses includes writing, editing, and proofreading many different types of technical documents, such as proposals, marketing collateral, reports, and instructions. Steve also has presented hundreds of hands-on workshops on technical/business writing, business grammar in the workplace, oral presentations in the workplace, and business etiquette. Over 10,000 business and governmental employees have benefited from these workshops. For the past decade, Steve has worked closely with K—12 teachers. He has presented many well-attended, interactive workshops to give teachers useful tips about technical writing in the classroom. Both Steve and Sharon have been awarded for teaching excellence and are listed in Who’s Who Among America’s Teachers. Steve is a Society for Technical Communication Fellow and won that organization's prestigious Jay R. Gould Award for Excellence in Teaching Technical Communication in 2016. In 2003, Steve was named Kansas Professor of the Year by the Carnegie Foundation for the Advancement of Education. Their wealth of experience and knowledge has been gathered for you in the Ninth Edition of Technical Communication: Process and Product.